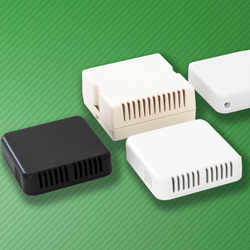 BCL Enclosures now offers the BCS Series sensor enclosures, which are especially created to keep the air flowing around sensitive electronics, including sensor probes, thermostats, temperature, gas and humidity sensing applications. Manufactured from ABS HB, the series is offered in several different models. BCS30W is a white sensor case with slots in two sides. It provides PCB mounting points, and for ease of installation, the wall mounting points are pre-drilled. The vented fastenings are snap-fit for convenience, with a screw fixing to one side. BCS30B offers the same specification, but in black, while model BCS30STW is a white solid top version. The dimensions of these three sensor cases are 80mm x 80mm x 21mm. For larger designs, BCS276W measures 84mm x 84mm x 36mm. This off-white medium sensor case is manufactured in ABS UL94 V-0. It features internal PCB standoffs, and a snap-fit top, vented on two sides. Two versions are available, for either wall mounting or desk mounting. Ideal applications include alarm cases and gas sensors, as well as many others. The company also provides a customisation service and can machine, punch and drill sensor enclosures to suit individual applications. The customisation service also comprises silk screen printing to customer designs.